A dismissed soldier, Bello Kasimu, arrested for impersonating the Nigerian Army (NA) at the weekend claimed he deserted the force after his salary was owed for nine months. Kasimu, who was dismissed in 2015 after he was absent without leave (AWOL) for several months from his place of deployment at the northeast, was paraded together with six others arrested for similar offences. The others are Taiwo Ayomide, Ale Michael, Adetileyin Segun, Olarewaju Yusuf, Ibrahim Isa alias Malaika and Ibrahim Abdullahi. Kasimu claimed he only wore army uniform the day he went to 81 Division headquarters to find out what was delaying the money. He said: “I was in the army but was dismissed in 2015. I was dismissed because I fled from my posting in Bauchi. I ran away because I was not paid salary for nine months. I was working without salary and so, I took permission to go and sort the salary issue out. Eyes Of Lagos gathered that, According to the General Officer Commanding (GOC) 81 Division, Maj.-Gen. Enobong Udoh, Kasimu paraded himself as a serving personnel and escorted trucks to various parts of the country. 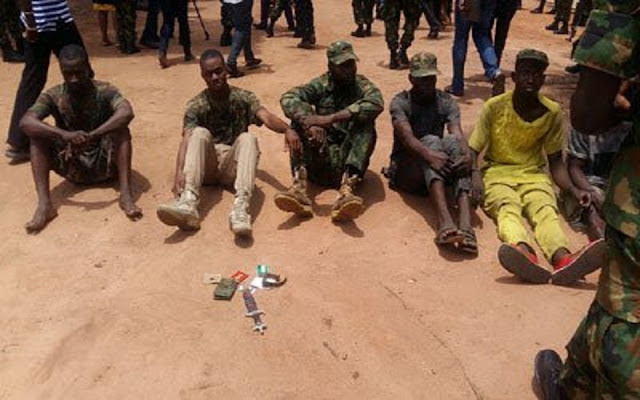 Udoh, who was represented at the parade by the Commander 9 Brigade, Brig.-Gen. Moundhey Ali, said Kasimu was arrested at Flower area of Ikorodu on April 17 by troops of 174 Battalion. He said the suspect wore camouflage Tees at the point he was caught, adding that a fake military identity card, mobile phone, court affidavit, Automated Teller Machine (ATM) card and a brown wallet were recovered from him. He said: “Similarly, on April 17, troops of 35 Artillery Brigade Alamala Barracks, Ogun State arrested an impostor, Taiwo Ayomide at Ademola Hotel, beside Yasmin Mosque Sagamu. The suspect, a resident of 46, Ojumile Street Sagamu, was dressed in military camouflage and was extorting money from unsuspecting citizens. “Items recovered from him include identity card, camouflage uniform, green beret and a military belt. Five other suspects were arrested by troops of 9 Brigade while on Operation Checkmate in different parts of Lagos.